As we all have undoubtedly heard by now, one of the pillars of the metal community has past on. Ronnie James Dio, the man with the incredible voice who had the undeniably difficult task of taking over the vocal responsibilities for Black Sabbath after Ozzy left the band, has succumbed to stomach cancer after being diagnosed less than one year ago. This is one of those monumental times where you will never forget where you were when you heard the news of his passing. In my opinion, this ranks up there with the deaths of Hendrix, Morrison, and Cobaine. With a career that spanned four decades, his presence has been felt by several diffierent generations. His work with Elf and Rainbow were the kickoffs for his illustrious career but it was when he got the call in 1980 to join the heavy metal pioneers Black Sabbath that he really became a household name. The albums Heaven and Hell and Mob Rules were classic albums that helped regenerate Sabbath as a power in the music world. He then continued his success with his solo career and put out one of the greatest heavy metal albums of all time with Holy Diver. It was and continues to be a pinnacle in metal, one that every metal musician aspires to achieve. Even as he went on in years, his voice never faltered, his enthusiasm for performing never waned, and his dedication to his fans continued to grow. He was the consmate front man and, from everything I have ever read about him, he was a genuinely kind human being. This is a great loss for metal and we will never see a man like Dio ever again. 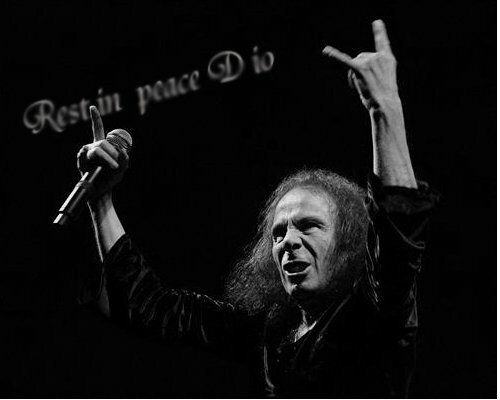 Rest in peace Dio, you are gone but never will be forgotten.